This hinged opening glass wall forms a picture window to the valley from the swimming pool inside. It opens in 25 seconds to offer a sense of swimming ‘out into the countryside’ from the flush fill pool. When open it additionally acts an awning to deter rain from driving into the pool room. This installation is typical of our renovation and upgrade projects. Despite seemingly good engineering advice at the time and a recommended supplier being appointed, the project had ground to an unsuccessful halt before commissioning. The client team spent fruitless months chasing the supplier before giving up. The hinged wall was of an inelegant design, rotating horizontally before stopping at a point that blocked about 25% of the hole , half in and half out of the building. We were then appointed to offer advice to help achieve the original vision. 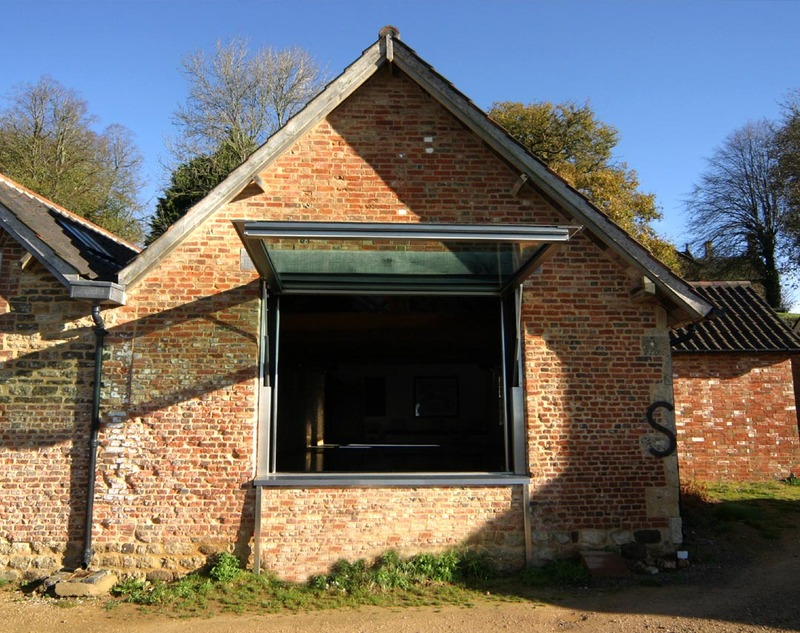 After detailed research we offered a number of design choices, ranging from converting the installation into a static fully sealed and insulated window, through to entire replacement of all parts to make a super slim fully opening top hinged glazed wall. As much as the client had originally envisaged such elegance, after the expensive and painful process 2 years later, ultimate ‘beauty’ had to be slightly compromised to limit further cost. We designed a way to reuse yet upgrade some of the most expensive original components: the 450kg double-glazed pane (dgu), the static chassis and the dynamic frame, whilst making substantial improvements to the look, operation and performance. Even though retaining the key elements, we were still able to significantly improve on the design by making it open fully. The glass was carefully removed and re-bonded into place, the existing dynamic frame was removed and strengthened on site, structural bracing was added to the static chassis, and insulation added. Fully-welded stainless steel flashings were added externally and internally. All the automation systems were changed to our own methods using electronically controlled hydraulic power. The installation now functions correctly in a more elegant manner, at over 4 times the speed of the original. An emergency manual pump is available to be used in case of power or system failure. This will close, or open, the glass wall as required. A hinged opening glass wall by a pool, fully opening to provide light and countryside views. 3.3m by 2.7m.